Sulphur (S) (atomic number 16 and atomic weight 32.066) has density of 2.05 gm/cc. Monoclinic S melts at 119.25 deg C and boils at 444.6 deg C. However, S and iron (Fe) are miscible, and Fe-S binary system at one atmosphere of pressure forms a liquid at temperatures as high as 1800 deg C, far above the boiling point of S alone. 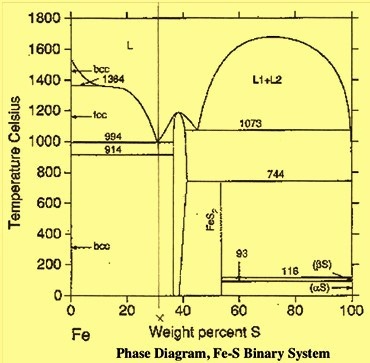 Fig 1 is the phase diagram of the Fe-S binary system at 1 atmosphere of pressure. S is an element which is always present in steel in small quantities. S in steel is introduced through iron ore and fuel (coal and coke). The removal of S during steel making is a tedious and difficult process. S is a relatively low cost addition and it is the cheapest free machining addition agent. Addition of S along with close control over the degree of its addition is an important step in the steelmaking process. There are various ways to add S into liquid steels. Usually S is added in the liquid steel (temperature round 1650 deg C) in the form of stick S which is, essentially, elemental S. In such additions the expected S recovery is around bout 40 % to 50 %. The non recovered S easily ignites in air to form sulphur dioxide (SO2), a noxious gas with a strong, pungent objectionable odour. Since the density of the stick sulphur (2.05 gm/cc) is low and the boiling point (444.6 deg C) is also low, this S vapour generation, and subsequent SO2 fume generation, occurs before liquid steel reactions involving S can reach completion. Here, the steel reactions are essentially the formation of MnS in the steel which is non odourous coupled with the vapourization of uncombined S which causes environmental pollution. In case of cored wire injection system the recovery of S is 60 % to 70 % with precise control of composition. In S cored wire, S is encapsulated in steel sheath, when injected into steel it can go in depth of liquid steel, where due to sufficient ferrostatic pressure, S bubbles slowly rises to surface and react efficiently in liquid steel. Also control of wire feeding with the help of wire feeder at desired speed ensures high recovery, precise composition control and less fumes generation. Thus the cored wire injection into the steel is environmental friendly due to less fumes generation and economical due to high recovery and less heat rejection. The chemical composition of S cored wire consists of 98 % minimum of S, 0.2% maximum of Si and 0.3 % maximum of moisture. Besides cored wire and stick S other common resulphurizing agents are flowers of S and iron sulfide (or pyrite, FeS). Manganese sulfide (MnS) and sodium sulphide (Na2S) or sodium sulphate (Na2SO4) are also used, but much less frequently. Ferro- sulphur (Fe-S) which is a sintered mixture of iron powder and S and containing 40 % of S is also used as resulphurizing agent for free cutting steel. All of the above products are relatively free from impurities and may be used without danger of contaminating otherwise clean steel. Resulphurization is normally performed in the steel teeming ladle. If added to the furnace, S tends to suppress the evolution of CO since it is also a fairly strong deoxidizer. This thermodynamic property can be beneficial in that MnS containing steels will not require so much aluminum (Al) for deoxidation, (silicon containing alloy additions are avoided in free machining steels since silicate inclusions are detrimental to machinability), thereby reducing cost. S additions are normally done in the form of cored wire. S containing core wire is typically added in the ladle furnace (LF). It can also be added to the tapping stream. All addition agents have low density and hence they float at the slag/metal interface. Hence additions are made with adequate mixing in the ladle to insure rapid dissolution. MnS is used in free machining stainless steels because it gives more consistent recoveries than pure S and better morphology and distribution to the sulfides. Pure S boils well below steelmaking temperatures. It also oxidizes readily in air. Basic slags react with S, tending to remove it from solution. Hence basic slags are therefore either held back or decanted in a heat to be resulphurized. S is a non metal normally regarded as an impurity and has an adverse effect on impact properties. The following effects of S become more significant when the oxygen (O2) content is successfully reduced. Formation of undesirable sulphides which promotes granular weaknesses and cracks in steel during solidification. S lowers the melting point and intergranular strength and cohesion of steel. S contributes to the brittleness of steel and when it exists in sulphide phase it acts as stress raiser in steel products. If steel is high in S but low in manganese (Mn), it produces the most pronounced segregation of all steel accompanying elements (segregation coefficient is 0.02). It leads to red shortness or hot shortness. In the absence of Mn, S readily combines with iron (Fe) to form low melting iron sulfide (FeS). FeS is a grain boundary phase which causes severe hot shortness during rolling or forging. In normal steels, even those which have been resulphurized, Mn contents are high enough (Mn/S = 8 minimum) to prevent this problem. Thus, S appears in the microstructure as MnS inclusions. If the steel has been hot worked (hot rolling and hot forging), MnS inclusions are deformed accordingly. Their shape and orientation, along with that of other nonmetallic inclusions, gives the steel a characteristic texture (anisotropic microstructure). The elongated MnS inclusions are of different effective area when loaded along different axes. This results in anisotropy of monotonic properties as reflected in directional ductility and impact properties. Hence S decreases ductility and notch impact toughness in the transverse direction. In high strength flat rolled products, where directional isotropy is important, this texture is definitely detrimental. To prevent it, extremely low S steels and the technology of inclusion shape control have been developed. Fatigue failures are the most common type of failures in steels with sulphide inclusions. These failures are governed by crack nucleation and growth. In a study involving billet and bar specimens, it has been reported that at 108 cycles the axial fatigue strength in the transverse direction was about half of that in the rolling direction, and that large but thin MnS inclusions were responsible for this deterioration in fatigue strength. Sulphide inclusions lower weldability and corrosion resistance. Presence of S may also lead to development of tear and cracks on reheating the steel. Weldability decreases with increasing sulfur content. Hence the welding properties of steels with high sulphur are poor. S increases susceptibility to welding cracks in steel. S is only sparingly soluble in steel (about 0.003 %) and takes no part in normal heat treatment reactions. Steel that must be machined contains S to break up chips and reduce tool wear. The exceptions are aircraft quality steels that, despite reduced machinability, have reduced S contents for the sake of improved mechanical properties. Common alloy steels contain no more than 0.04 % S. Free machining resulphurized carbon steels in the AISI/SAE 11XX series contain 0.08 % to 0.13 % S, but the AISI/SAE 12XX series carries up to 0.24 % to 0.33 % S (and 0.04 % 0.09 % P). Resulphurized stainless steels, such as types 303 and 416, contain up to 0.35 % S.
The directional ductility and impact properties of plate steels are reduced by the presence of elongated manganese sulfides and other inclusions. For this reason, S is kept as low as 0.005 % or less in these steel products, particularly when they are used for such critical applications as arctic grade line pipe and ship plate. Mention is however being made, of what has been called the ‘sulfur paradox’ in high strength low alloy (HSLA) steels. Increasing the S content from a nominal, say 0.008 % to 0.060 % lowers the Charpy upper shelf level, thereby raising the transition temperature as fixed by a given impact energy. However, when transition energy is defined at, for example, 85 % shear area in a Battelle Drop-Weight Tear Test (BDWTT), the trend is exactly the opposite. S content specified for given steel must therefore be predicated on the stated design parameters. Other considerations are also important, however. High S contents are known to increase corrosion rates in certain environments. They promote stress corrosion cracking and hydrogen induced cracking, possibly, through electrochemical or ‘poisoning’ effects.